Gorgeous! 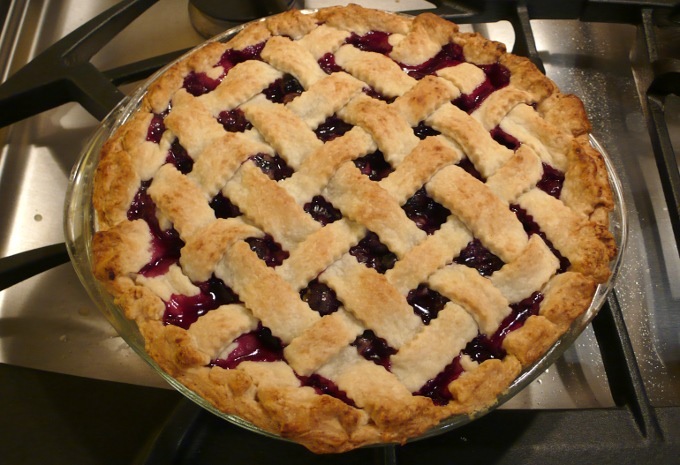 I am bookmarking this one for July/August, when the Maine blueberries will finally be sweet enough for this incredible looking pie! This was WAY too tart, so much so that even ice cream on top couldn’t help it. The crust was amazing, but the filling was awful. I made it again and this time I substituted a 1/2 cup of regular sugar for the brown sugar. I also added 1/2 teaspoon of cinnamon and a splash of vanilla. I mixed the sugar, corn strarch and cinnamon together, then added the blueberries. I mixed them well then poured them into the pie shell. I sprinkled the lemon juice on top with a little more sugar and it was much better. If your bueberries are very sweet you can lessen the amount of sugar. I forgot to add that I left the salt out of the filling completely. A quick tip for the crust; freeze the butter and then grate it. It’s so much easier to cut into the flour that way. This crust was so wonderful and flaky.